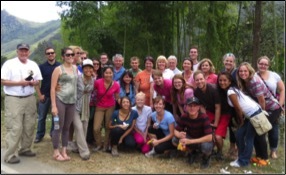 A group of 19 volunteers were led by Chris Bogus and Mimi Kameshige to the northern region of Piura, Peru to conduct five days of vision clinics throughout under-served and rural communities. 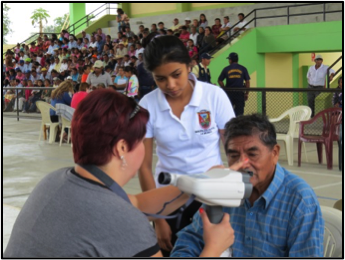 We collaborated with the Regional Government of Piura, the Northern Ophthalmologic Foundation and an organization by the name of HELP International. Accompanying us was a local optometrist from Bringham City, Dr. Bill Harrison, and his wife and daughter. Additional trip participants were from the Park City and Salt Lake City area. After a cursory tour of Lima the day after we arrived, we boarded our flight to Piura. The following morning we started our first day of clinic in a small town by the name of La Matanza. Local volunteers and policemen greeted us with a warm welcome, as they were eager to help us. Many people were already lined up outside the large, municipal stadium when we arrived around 8:30 a.m. but the local police did a great job handling the crowds. The elders of the community held much respect from the locals as they were pushed to the front of line to be seen first. Thanks to our multiple training sessions prior to this trip, the team was able to set up and were ready to go far more rapidly than we had even hoped. With three retinomaxes and our improved, computer search program by Max Johansen, we were able to see 426 people of all ages. Towards the end of the day, we squeezed in time for the local volunteers and policemen to be seen as well. The municipality provided dinner and the two Alcaldes (mayors) presented a certificate of recognition to us in appreciation. They also presented us each with a gift; jars of locally made honey. Everyone who worked with the municipality of La Matanza was so appreciative of our help and it was really the only place we had felt this gratitude. Every local worker was genuine and kind and we would love to return to this area in the future. Perhaps a future suggestion would be having more than one day of clinic in this community. There are many individuals in need throughout this area as the environment is desolate in eye care resources and basic necessities as well. Moving on, we spent the night in Chulucanas and departed for Frias the next morning where we would work for the next two days. Driving up the canyon for about two hours, we arrived in a beautiful town in the lush mountainsides of the Northern Andes. Agriculture was prominent with the cultivation of corn and potatoes. People were waiting patiently inside the municipal stadium as we were setting up our clinic and the first thing we noticed were all the tall hats they were wearing. Since many of them worked outside, these hats did a great job protecting their eyes. Pterygium was less prevalent and it was such a change from the day before. There were still older individuals whose eyes were red and irritated, but there was hardly to any growth of pterygium in their eyes. 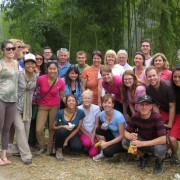 We dispersed sunglasses to the young adults in hopes of preventing pterygium. Also, if individuals came in and they did not need glasses we would give them a pair of sunglasses and explain the benefits of protecting their eyes. Many older ladies had walked distances of over two hours to make it to the clinic. It was amazing to see their delight in a new pair of glasses. Schoolchildren from the local elementary school were also seen, often given negative spheres to see far distances. The first day in Frias we saw 355 people and the next day we conducted only a half day of clinic since we needed to get on the road to our next destination. During the half-day of clinic we started at about 8:30 am and ended around 1:30 pm. We were still able to see 275 people that morning. The mayor of Frias was very amiable and appreciative of our work as well. Leaving the town around 2:30 pm, we made our way back to Chulucanas for dinner before our long bus ride to the next town of Huarmaca. Originally, the plan was to drive to Huarmaca early in the morning from Chulucanas but since that drive was roughly 6 hours, we decided to do it the night before. The drive was long and bumpy and our bus was definitely not luxurious. However, no volunteers in our group complained about the conditions and knew that it was all part of what they had signed up for; up to a point. We finally arrived into Huarmaca at 1:30 am. It was cold and windy and everyone was tired, so we knew there wouldn’t be much sleep that night but the next morning everyone was up and ready to serve the community. Everyone worked extremely hard and we saw a whopping 481 people in Huarmaca to bring our trip total to 1,537 patients served. All of our sunglasses had been given out as were many reading glasses. There were also a handful of young adults and children from an orphanage that housed domestic abused children. A few had scars and cuts near the eye from domestic abuse and many were shy and soft-spoken. We fit them for eyeglasses and gave others a pair of new sunglasses. With this, their faces showed an uplifted spirit. Overall, this expedition was a huge success and we couldn’t have asked for a better group of volunteers as everyone worked incredibly well together and put in all the effort towards accomplishing a common goal. Despite travelers’ gut issues and grueling bus rides the entire group put those they served first and assisted many in not only vision care but also in friendship. We are very proud of the accomplishments made during this vision expedition and look forward to future endeavors. Mark Your Calendar’s for Saturday, 28 July Noon till 3:00 p.m.